Everyone loves gadgets. And those of us who love to RV, tend to love RV gadgets that make life easier. 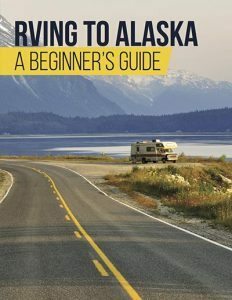 Whether you live in your RV full-time, or only spend a few weekends a year traveling in it, here are a few RV gadgets that you are guaranteed to love. These are my favorite gadgets that keep life running smooth on the road. If you’re like me, you want to customize your rig and make it feel like a home. 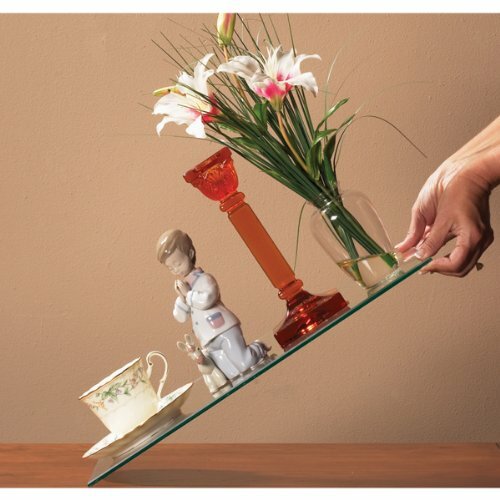 Quake Hold allows you to display your favorite china, rock collection or chachkis safely. A small piece of Quake Hold putty under your item will fix it to any hard surface. When you are ready to move it just twist. The item will stay put when you travel, but come off when you want to move it. AWESOME. Command Strips are an RVers best friend. Whether you want to hang photos, art or a mirror, Command Strips will secure your item to the RV wall without any damage. Need to move something? No problem. Simply pull the tab and the strip will release from the wall. The Command brand also make hooks. These hooks come in all different shapes and sizes. Use them to hang your purse, your coat or your keys. You can even find water proof hooks for the shower. Love it! Etsy and Ebay provide abundant opportunities to find vinyl wall art in a variety of colors and designs. From swirls to sayings, you can customize your fridge, mirrors, cabinets and walls. Add some fun! Add some vinyl. Curtains add texture and dimension to an interior. They also block heat. Light blocking curtains available at Walmart, Target and Hobby Lobby are a great RV addition. 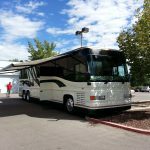 Not only will they customize and soften your RV, they will also save you money. Heating and cooling bills add up. Light blocking curtains provides extra insulation to keep your bills low. Sound good right? Crockpots are a great addition to any RV. They cook without releasing a lot of heat. With slow cooker liners, life is even easier. Add a slow cooker liner to your pot and then fill it with food. Once you have finished your meal simply toss the liner and your pot is clean! Foil packets are a campers best friend. Commercial grade Reynolds Wrap is perfect for making pillow style food packets that cook over a fire or grill. No cleanup and easy portions. What’s not to love? My favorite kitchen gadget has got to be the Cuisinart Oven Central Countertop Oven. 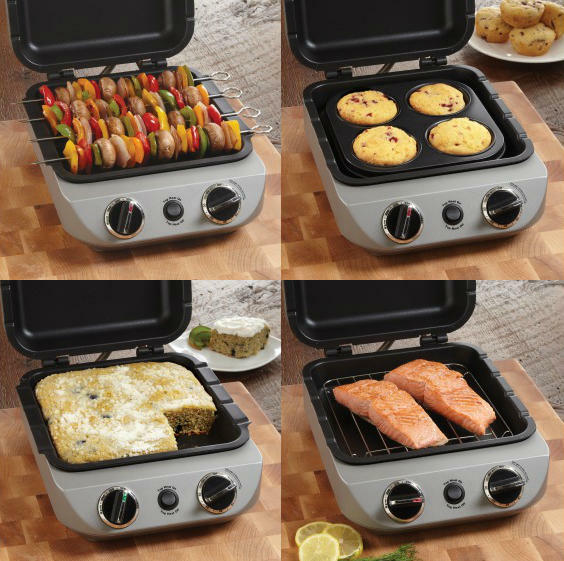 It comes with a grill, muffin pan, bake pan and space for kabobs. I use this oven for everything you can imagine and rarely use pots or pans. This unit is amazing! If you’re living in an RV you need appliances that are multi-purpose. I like the Secura 6 in 1 Electric Pressure Cooker. It offers browning, steaming, crockpot, pressure cooker and rice cooking all in one. The pot comes out for easy washing, and you can buy add-on pans for baking. This unit does it all! Why heat up your kitchen when you don’t have to? 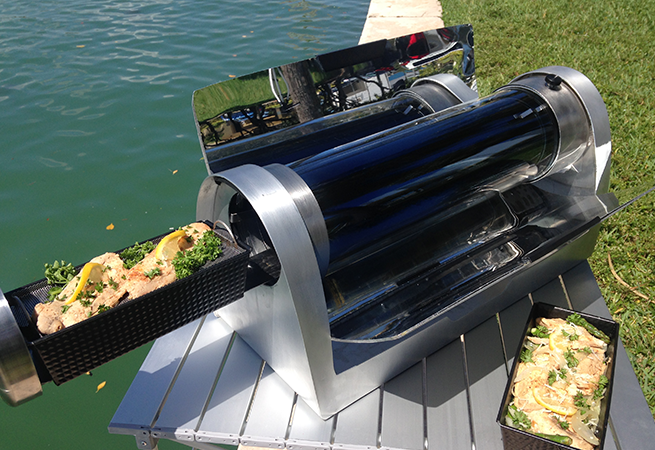 Use the sun to cook your food. The GoSun portable cooker is an easy to use cylinder style oven. It folds down for easy storage. The HotLogic Mini Personal Portable Oven oven is another affordable option that is similar, but you plug in! This baby can chop, blend, stir and whip. It’s compact size it perfect for RVs. If you’re anything like me, you never have enough counter top space. That’s why I love this Undermount front of sink cutting board. It hooks to the counter and allows you to slice, dice and chop at the sink. Toss the scraps into the garbage disposal and rinse your produce all in one easy step. Whoever came up with this idea was a genius! The Camco double refrigerator bar keeps food from shifting while traveling. I use mine on the top shelf to secure gallon jugs of milk and water. They take 5 seconds to install and are well worth the $5~ GREAT BUY. Moisture is an RV’s enemy. A simple shower squeegee will keep your shower free from excess moisture. It will also help your shower stay clean longer. Squeegees are inexpensive and work wonders. Think RainX is just for windshields? Think again. Rain works great on glass shower doors. The shower water will bead and roll right off the glass. No stains. No mildew! Collapsible tubs work great for dishes, foot baths or general cleaning. Pop it up when you are using it. Pop it down for storage. It’s as easy as that! Fill a spray bottle with water and a tiny bit of dishwashing soap. Spray your dishes before you put them in the sink. This simple step will act as a pre-soak and help you use less water come washing time. AMAZING. If you frequent the laundry mat you will love this gadget. Shout Color Catchers will help you save money. 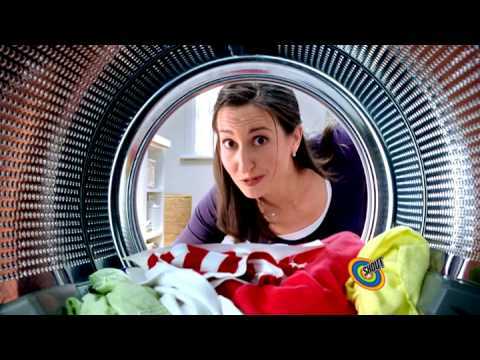 Choose an oversized washer and forget about sorting. Toss all your fabrics together and add a color catcher. If any of the dye tries to escape, the color catcher grabs it and keeps it from your other clothes. You save a bundle washing and drying everything together. WOW! This stain remover bar comes in a plain brown wrapper and works to remove just about everything. Wet the item, rub the bar over the stain and rinse. Simply Clean is easy to use and works on all types of fabrics and carpets. GREAT NEWS! I saw this idea on a YouTube video and have been using it ever since. Traveling with no time to wash socks and undies? No problem. Fill a plastic bin with cold water, your laundry and a dash of soap. Click the lid on for a tight fit. Place the bin in your shower and head out on the road. At the end of the day, the movement of your rig will agitate the clothes. Just rinse and hang. 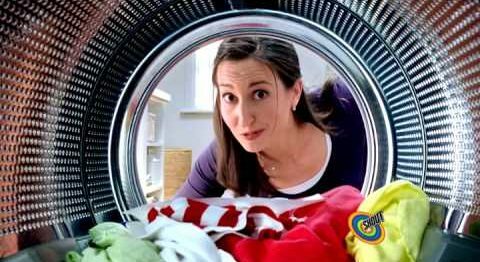 The perfect emergency washer! SO EASY. This may or may not apply to laundry, but it certainly applies to the organization. A multi-pocket organizer will keep your makeup, shoes, or office supplies in one handy location. You can even cut the organizers in half and use them in more than one place. Hang them on the back of a door or use command hooks to mount them on the inside of cabinets or the base of your bed. SO EASY. If your rig has a slide you know how easy it is to bang your head. Those corners can really hurt, especially if you are underneath one. 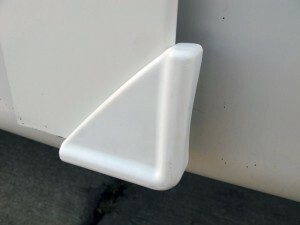 Corner guards add a softer edge and prevent cutting your head or arms. CAN YOU SAY WORTH IT? This is a no brainer. You need to have at least 2 extinguishers with you at all times. One for the engine and one in the kitchen. Make sure they are up to date and safe. In an emergency, you need to know it works! If your rig didn’t come with a Carbon Monoxide Alarm, get one. These alarms detect gas leaks that humans can’t always smell. This is especially important if you own a diesel pusher and your bed is in the back to the engine. BE SAFE! Mail security doesn’t stop just because you are traveling. A mini paper shredder is a great item for the full-time RVer. Choose a cross cut unit that will emulate your information and keep is safe from thieves. IT’S WORTH IT! If you live in your rig year round, a dehumidifier is essential. Moisture is an RV’s enemy and you would be amazed by just how much moisture your rig can hold. I use a portable dehumidifier to keep the air dry and to avoid dripping skylights. NewAir makes a 25-pint portable unit that is easy to roll from one area to another. My best tip? Spend the money now so you don’t spend it later on repairs! You are out in the middle of nowhere camping when your phone rings. Unfortunately, you don’t have enough bars to take the call. You dash left and right trying to find a signal to no avail. What should you do? Easy! A cell booster will increase the range of your phone, especially inside your RV. There are a variety of units available so be sure to read reviews to locate the right one for your unit. Can you hear me now? Free wifi is only a good deal if it works. Increase your chances with a wifi booster placed on the top of your rig. The WiFi Ranger with a signal booster is a must have for serious internet users. Sure, it won’t change bad connections, but it will increase your ability to use good ones. Why plug in when you don’t have to? Solar phone chargers are the perfect way to use less energy and stay connected. Solar chargers are available for phones, tablets , and laptops and even come on backpacks. Sign me up! Bluetooth is a reverse friend. No wires necessary. 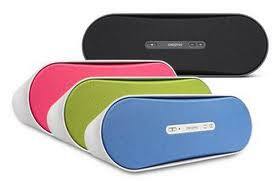 A Bluetooth speaker can connect with a variety of tech gear. Try your phone, t.v., tablet, iPod or even your radio. Take the sound where you are and make life a whole lot easier! Bring the music with you wherever you are. Or fill it with podcasts, audio books or news. This simple MP3 style player replaces CD’s and makes traveling a whole lot easier. This is a MUST HAVE. If your RV park has solid WiFi, a Roku will allow you to stream hundreds of on demand TV channels (many that are free!) You can also connect with Netflix, Hulu, Crackle and a variety of other channel options. Who needs satellite when you have a Roku? Small, portable fans are essential for keeping your rig cool with or without air conditioning. Air movement makes your air conditioner more effective. It also keeps things fresh inside. Anything RV has to be small and multipurpose, that’s why I recommend the Honeywell Turbo Force Fan. These units are available everywhere. They are inexpensive, powerful, quiet and can be used for a variety of purposes. Use them to keep cool, dry clothes or push hot air out the windows. Yup. They make these, and some RVers don’t want to live without them. 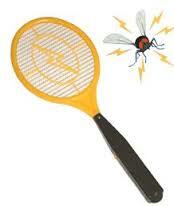 Electric fly swatters or bug fryers are a great way to keep your RV free of pests! Enclosed fire pits are legal in many parks both national and private and they add a homey feel to your site at night. If you love fire, look for a portable unit or make your own. Solar panels are all the rage, but if you don’t want to install them on your rig try something portable. Go Power! offers 120W solar kits with a 10 amp controller. These units fold up for storage and can be set up wherever you are. They come with 15 feet of cable and a carrying case. What will solar do for you? These panels will keep your battery charged when you’re not plugged in. This means hours of extra fun, wild camping in your RV. Well, that’s the end of my list. I know I have missed a ton of great ideas so I want to hear yours. Scroll down to the comments and tell me your tips, tricks and top suggestions. What gadget can’t you live without? What gadget do you most wish you had? Like this article? Share it with your friends, family and enemies alike. Tweet it, pin it, post it, send it. I always appreciate your help spreading the word.